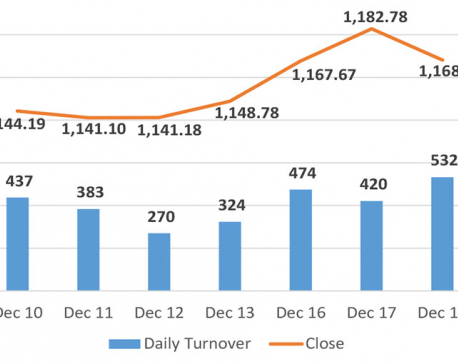 KATHMANDU, Dec 3: The equity market remained under pressure since the beginning of Sunday's trading session ending the day firmly in the red. 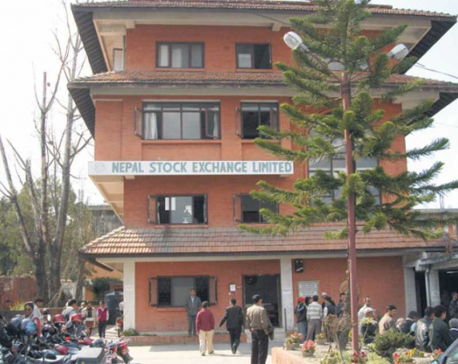 The Nepal Stock Exchange (Nepse) Index slumped over 17 points or 1.54 percent to close at 1,130.63 points. With the day's decline, the index hit a 3-year low. 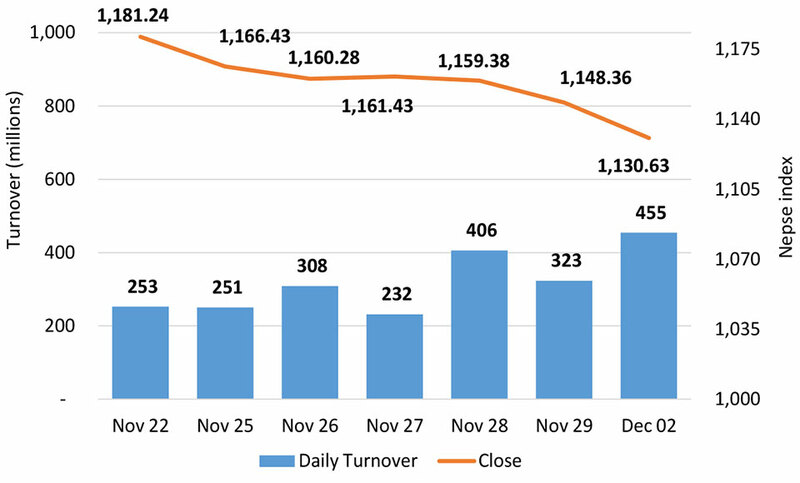 Even though the index showed a decline, stocks worth Rs 454 million were traded on the day. Most of the major sectors ended the day on red zone except the trading sub-group which rose 1.25 percent. On the other hand, Non-Life Insurance, Microfinance and Life Insurance stocks struggled the most as their respective sub-indices dropped over 2 percent each. Furthermore, Hotels, Banking and Hydropower sectors posted losses of 1.86 percent, 1.54 percent and 1.35 percent, respectively. Similarly, the sub-indices of Others, Finance, Development Banks and Manufacturing & Processing stocks also closed in the negative territory. Nepal Bank Ltd dominated the list of active stocks as the bank's scrip posted a substantial turnover of over Rs 71 million. Secondly, NMB Bank Ltd registered a total transaction of Rs 34 million. Nepal Life Insurance Company Ltd shares also traded actively and recorded a total turnover of Rs 29 million. Banking stocks followed with Global IME Bank Ltd, Prabhu Bank Ltd, NIC Asia Bank Ltd and Sanima Bank Ltd, Nepal Investment Bank Ltd logging in turnovers of over Rs 10 million apiece. Among advances, shares of Vijaya Laghubitta Bittiya Sanstha Ltd rallied above 8 percent on Sunday after the micro-finance announced 10 percent bonus shares and 100 percent right shares to its shareholders. After the issue, the paid-up capital will reach Rs 389.6 million. Further, shares of Tinau development Bank Ltd also surged 2.37 percent. Meanwhile, Bishal Bazar Company Ltd, Kalika Power Company Ltd and Rairang Hydropower Development Company Ltd posted gains of over 1 percent each. In contrast, shares of Lumbini General Insurance Company Ltd, United Insurance Company Nepal Ltd and Arambha Microfinance Bittiya Sanstha Ltd shed almost 8 percent apiece. Other top losing scrips include Barun Hydropower Company Ltd, Nagbeli Laghubitta Bittiya Sanstha Ltd and Sanima Bank Ltd.
On the earnings front, Sagarmatha Insurance Company Ltd published its first quarterly financials of the Fiscal Year 2018/19 reporting a net profit of over Rs 36 million. Besides, United Modi Hydropower Company Ltd announced its Annual General Meeting (AGM) on December 27. The respective AGM is due to approve 5 percent cash dividend to the hydropower's shareholders. Everest Bank Ltd which had announced 20% cash dividend few weeks back also confirmed its annual general meeting (AGM) to be held on December 25. In addition, Joshi Hydropower Development Company Ltd has commenced its Initial Public Offering (IPO) of 1.69 million unit shares which will last till December 5. As per the ARKS technical analysis, the market posted a significant loss on the day with the formation of a bearish candle. With Moving Average Convergence Divergence (MACD) trending in the negative territory and Relative Strength Index (RSI) also looking down, all the indicators suggest a bearish market for the time being.